Articulated and static large scale model makers with 3D design capability for sculpture, experiential promotion and billboard advertising. Over recent years we have recognised a definitive trend towards large scale models and sculpture pieces. 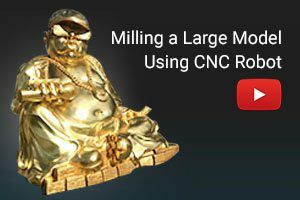 To meet this demand we have invested heavily in large CNC milling machines and CNC routers as well as Delcam 3D CNC machining software which enables us to break down large models into manageable pieces that can be machined from solid high density foam or model board. In this way complicated large scale structures can be produced in sections by our large model makers and precisely assembled to create stunning crowd stopping models which are typically used on large billboard sites, mounted on vehicles, fixed to the front of buildings, exhibition stands and standalone sculptures. Where weight is an issue we will choose a construction method involving a lightweight aluminium or steel structure with a fibreglass skin. Finishing is usually a robust 2 PAC painted finish suitable for long term outdoor use although we can carry out all types of finishes including electro plating, texture, polishing, chrome effect and aged/distressed finishes. Our largest model to date was a representation of the Mount Rushmore American presidents sculpture. Nike commissioned this 40 metre long piece for their South Africa World Cup campaign. The model was to occupy the largest bill board site in London which often hosts 3 dimensional models. As is the case on many large projects we teamed up with another company who provided the main structure and the simpler elements of the project. The role of our large model makers was to create the heads of 6 members of the England football team at 4 metres tall. The initial phase was to collect 3D laser scan data by meeting each footballer. Laser scanning provided all the information necessary to create a 3D model. From this we could break the model into manageable sections of 2 metres x 1 metre x 1 metre. By CNC machining the pieces we could produce very accurate large scale detail and precision assembly of the various pieces. The sheer size of the model required a lightweight material so polystyrene was the obvious choice. A stone effect painted finish was applied to match the real massive scale mountain sculpture. Another prestigious large scale sculpture completed by our model makers was an 8 metre long airliner model. The requirement was to mount the model inverted and raised to 4 metres. In addition the sculpture needed to be stiff and robust and be broken down into smaller pieces for shipping and re-assembly worldwide at various exhibitions. Overall weight was a major consideration so a GRP fibre glass method was chosen for the fuselage. CNC machining was used to create the fibre glass masters from 3D CAD model data drawn by our 3D design engineers. The wings and tail plane were also CNC cut from lightweight foam and then skinned with a lightweight ply. To generate the stiffness the model was built onto a complicated tubular aluminium space frame which could itself be dis-assembled for transport.